Our First Iceberg Sighting: After a day of crossing the Drake Passage, we encounter our first iceberg. 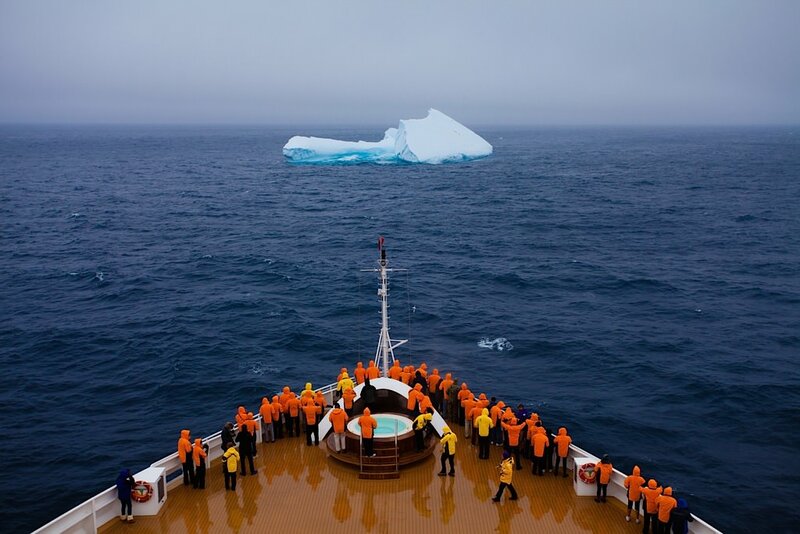 The excitement on deck was palpable as the iceberg signaled that we were reaching the Antarctic Peninsula. © 2014 Avid Travel Media Inc. Crossing the Drake Passage had turned out to be largely uneventful. Despite yesterday’s concerns of rough seas (see Preparing To Cross The Drake Passage), we crossed what Seabourn Quest Expedition Team Leader Robin West referred to as “Drake’s Lake.” Seas were calm and the ride was smooth. The day on board was filled with presentations by the expedition team about all things Antarctica and a bustle of activity. The spa and fitness center were busy, the bars and restaurants were active. Some guests relaxed in their staterooms, others stood out on deck spotting seabirds. Avid photographers aimed their cameras at the wide-winged Albatross, with wing spans of up to 12 feet. The day was proceeding as planned until West announced an iceberg ahead. The excitement was palpable and soon all hands were on deck to view the spectacle of this huge chunk that had broken off the Antarctic ice shelf. Captain Bjarne Larsen slowed Seabourn Quest and circled the iceberg so that guests could see it up close. I was surprised to see that there were a few dozen penguins marching up one of the sides of the iceberg. The floating chunk of ice was beautiful, particularly at the waterline, where it appeared as Windex-blue. It was gorgeous. As I look back on this photograph, I realize that although the iceberg was beautiful, it paled in comparison to what was ahead for us. Still, a big cube of ice is not something you see everyday, and this one marked the beginning of a heightened sense of excitement that continued to buzz throughout Seabourn Quest during our entire voyage. At last, we were experiencing Antarctica. Our First Iceberg Sighting – Crossing The Drake Passage from Ralph Grizzle on Vimeo.